Mill Creek's Laughing Buddha Yoga Studio's Tai Chi master, Eric Braff, is a motorcycle rider in the documentary The Highest Pass premiering in Seattle June 15th. The movie had a brilliant run in Los Angeles recently. It was number one at the Santa Monica Laemmle two weekends in a row. The Highest Pass is a motorcycle journey through India's Himalayas over the highest motorable road in the world. The film crew followed a dare devil yogi leading seven Americans to make decisions about life and death while traversing steep, icy cliffs and the chaos of India's "road killer" traffic. Carrying a prophecy of death in his late twenties, their Yogi leader Anand Mehrotra inspires them to question what it means to truly live and pushes the riders to the limits of the teachings: "Only the one who dies, truly lives." The film documents Master teacher Anand Mehrotra's journey of transformation with seven motorcycle riders including the Mill Creek Laughing Buddha Yoga Studio's Tai Chi master Eric Braff. Trip leader and master teacher Anand Mehrotra; filmmaker, producer and rider Adam Schomer; and Mill Creek Tai Chi master, Eric Braff will be on hand for Q&A after the film on the evenings of June 15th and 16th. There will also be a special showing on the evening of Sunday June 17 for Seattle area yogis, their friends and family. Seattle is known for its vibrant yoga community. Anand, Adam, and Eric will be available after the show for a special Q & A session. "Both haunting and inspiring," says legendary singer, Jon Anderson (lead singer of YES) about The Highest Pass. Jon sang two original songs for The Highest Pass, including the title track. 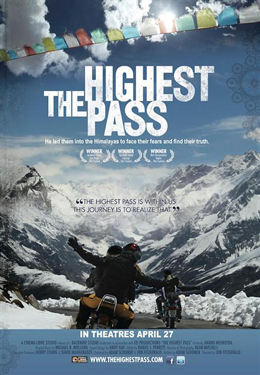 The Highest Pass has been awarded: Best Documentary, Naples Film Festival, Audience Award, San Diego Film Festival, Best Picture, Topanga Film Festival and Official Selectiob, Ashlan Film Festival. The film will be Showing at the Regal Meridian 16, 1501 7th Ave, Seattle. Tickets go on sale June 8th and can be purchased from Fandango.com.